Mak Plus Power Systems, 480V AC input and 24V DC rectifier is equipped with almost all parameters of and anodizing bath in addition to be a normal anodizing rectifier. Basically the system running in the special program of study with voltage-controlled output voltage ramp to the desired period of time given as a constant voltage control is provided. With the 24V rectifier that do micron calculation system apart from the component number desired micron thickness is plated automatically by the system. At the same time the bath temperature is controlled to ensure ideal anodizing process from Germany. MAK Plus control system perceives the surface of the component automatically and calculates the necessary operation time for the desired thickness . The operator just enters the value of desired thickness and pushes the start button. All the other processes are made by the rectifier automatically. Anodizing bath should be between 18 - 22 C.Pool temperature is measured by the anodizing rectifier and shown on the panel so there won’t be an external measurement needed which allows easier operation. The minimum and maximum pool temperature values are entered in anodizing programs. 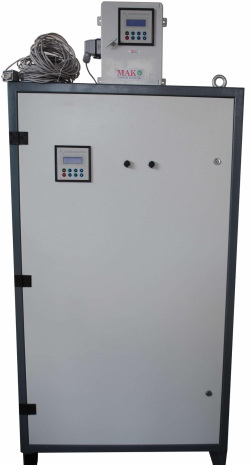 The rectifier measures the pool temperature and checks the conformity to the given values and runs the cooling system if needed and stops when it is reached to the desired temperature so there is no need for complex temperature control mechanisms. The running program is kept in record of the system for aluminum components with different characteristics. The recipe on the system record is loaded for the different component and process can be started faster which also ensures standard production as well as keeping out from conflict of which recipe should be applied. The operator panel designed for anodizing rectifiers has touch-screen ,colored and wide screen. All functions of the device can be defined on this screen including calibration process, preparing precipices for components. The operator panel has IP65 protection class which is not effected by the moisture,acid...etc. at the environment and can be used for years safely. Mak Plus Power Systems, 24V rectifiers are anodizing rectifiers have PLC control system which are durable for years and high reliability since they are made by industrial components. It’s open to innovations with flexible programming features.If the device is required to work with an outer system it can be adopted to any automation system easily.